I HAD not planned to devote an entire post to Kisan Baburao Hazare or Anna (older brother) Hazare, as he is more commonly known, but with his arrest earlier this week (a major misstep by the government) and the subsequent widespread protests in different Indian cities making news in the pages of The New York Times, The Washington Post, and more, there is too much to share. 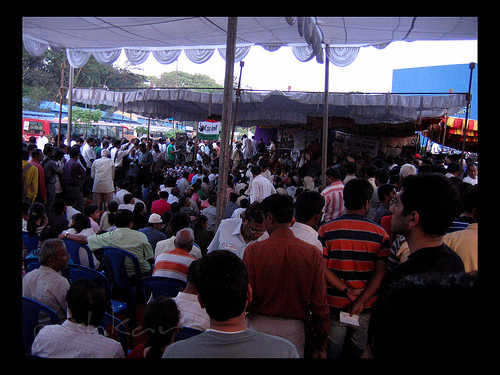 A rally against corruption which took place in Freedom Park, Bangalore on 9 April 2011. Courtesy Pushkar V.
Now Hazare has cornered the government by raising the pitch of the argument, just two days after India’s 64th independence day. A fast unto death is a touchy subject in India because of the memory of Mahatma Gandhi, who used the tactic against the British. One thing successive viceroys and prime ministers particularly feared was the popular uprising that would quickly follow if he died on their watch. The viceroy Lord Wavell wrote in his diary in 1944 that if Gandhi were to die in prison: “I might go down to the readers of two thousand years hence with the same reputation as Pontius Pilate.” Many in India are calling the present events “the second freedom struggle”, since the government is relying on quasi-colonial laws to maintain order and restrict freedom of protest. There is the obvious irony of Congress being the party that used these techniques against the British. 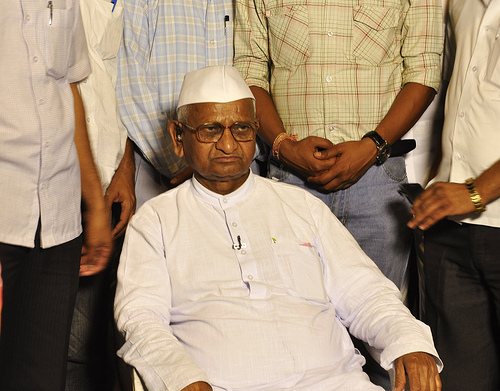 The reality, though, is that Anna Hazare is an imitation of Gandhi, pursuing a different agenda. The morality of fasting unto death for a political cause in a constitutional democracy has always been a tricky issue. There is something deeply coercive about fasting unto death. 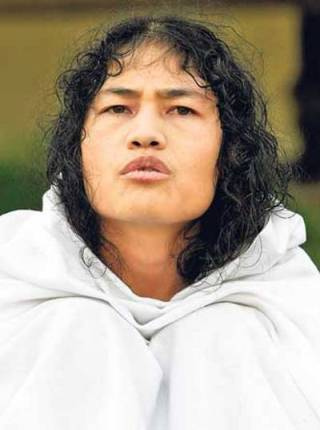 When it is tied to an unparalleled moral eminence, as it is in the case of Anna Hazare, it amounts to blackmail. There may be circumstances, where the tyranny of government is so oppressive, or the moral cause at stake so vital that some such method of protest is called for. But in a functioning constitutional democracy, not having one’s preferred institutional solution to a problem accepted, does not constitute a sufficient reason for the exercise of such coercive moral power. To call Anna Hazare the 21st-century Gandhi, as some have started doing, is pure hyperbole, but many would see a similarity in their methods — in particular, in their resorting to fasts to achieve their objectives. This, however, is erroneous. Indeed, the fact that so many people consider Anna Hazare’s method to be similar to Gandhiji’s only indicates how little contemporary India remembers or understands Gandhiji. Gandhiji undertook 17 fasts in all, of which three were major fasts-unto-death. All these three had the objective of uniting people against violence, rather than extracting specific concessions from the colonial State. In short, Gandhiji’s fasts-unto-death were never a binary affair, with himself and the colonial State as adversaries, to extract specific concessions. He did not, for instance, go on a fast-unto-death to demand the withdrawal of the salt tax; he launched instead a movement against it. And at no stage did Gandhiji ever consider going on a fast-unto-death to demand India’s independence; instead he launched movement after movement for achieving it. Indeed Gandhiji would have considered a fast-unto-death to enforce a particular demand even upon the colonial State, or to extract a particular concession from it, an act not of non-violence but of violence. While those in the Arab Spring for the most part are pushing for a complete overhaul—a revolution—in how they are governed, those taking to the streets in Delhi are not. Indeed, their demands by the standards of international protests are almost embarrassingly modest and narrow. Perhaps there is another layer being added now—a broader discussion about the proper relationship between government and civil society. But both sides are playing within fairly well-defined rules and within a system that can tolerate, and gain from, dissent. The outcome of the ‘Anna Hazare’ phenomenon allows the ruling Congress to appear gracious (by bending to Anna Hazar’s will) and the BJP to appear pious (by cozying up to the Anna Hazare initiative) and a full spectrum of NGO and ‘civil society’ worthies to appear, as always, even holier than they already are. Most importantly, it enables the current ruling elite to have just stage managed its own triumph, by crafting a ‘sensitive’ response (ably deployed by Kapil Sibal) to a television media conjured popular upsurge. Meanwhile, the electronic media, by and large, have played their part by offering us the masquerade of a ‘revolution’ that ends up making the state even more powerful than it was before this so called ‘revolution’ began. Some people in the corridors of power must be delighted at the smoothness and economy with which all this has been achieved. Hosni Mubarak should have taken a few lessons from the Indian ruling class about how to have your cake and eat it too on Tahrir Square. But the general premises that underlie the various drafts border on being daft. They amount to an unparalleled concentration of power in one institution that will literally be able to summon any institution and command any kind of police, judicial and investigative power. Power, divided in a democracy, can often be alibi for evading responsibility. But it is also a guarantee that the system is not at the mercy of a few good men. Having concentrated immense power, it then displays extraordinary faith in the virtue of those who will wield this power. Why do we think this institution will be incorruptible? The answer seems to be that the selection mechanism will somehow ensure a superior quality of guardians. Why? Because the selection committee, in addition to the usual virtuous judges, will have, as one draft very reassuringly put it, two of the “most recent Magsaysay Award Winners”. Then there is no sense of jurisdiction and limits. It is not going to look at corruption only. It can even look into “wasteful” expenditure. They can, potentially usurp all policy prerogatives of democratic governments. So many accountability institutions, in the name of accountability, are not distinguishing between policy issues and corruption. They are perpetuating the myth that government can function without any discretionary judgment. But the demand is premised on an idea that non-elected institutions that do not involve politicians are somehow the only ones that can be trusted. This assumption is false. Institutions of all kinds have succeeded and failed. But the premise of so much accountability discourse is not just contempt of politicians, but contempt of representative democracy. The best thing about Indian politicians is that they make you feel you are a better person. Not surprisingly, Indians often derive their moral confidence not through the discomfort of examining their own actions, but from regarding themselves as decent folks looted by corrupt, villainous politicians. This is at the heart of a self-righteous middle-class uprising against political corruption. This is a protest, not a revolution. I sense a lack of emotional proportion and a troubling hypocrisy from a middle class that refuses to get as moved to action by graver things, such as the murder of female children, child labour in homes, hotels and factories, or poverty outside our car windows. There is excitable talk now of the constitutional right to protest, but this is not something we like to give to Kashmiris, or bother too much when it is snatched from tribals or others on the margins of middle-India’s imagination. It is easy, and convenient, and costs nothing to “support” the Lokpal Bill: sign an online petition, join a Facebook group, maybe even go out on the streets to protest corruption. Everybody is anti-corruption, even Bollywood’s beautiful people (except Mahesh Bhatt), after all, and you’re just along for the ride. But try raising the devastating farmer suicides, or the draconian laws in the Northeast, or the rampaging violence in Kashmir, and no one pays much attention. Certainly nothing like the Lokpal phenomenon. The 1990s saw marketing whiz kids at the largest English daily in the world steal a term then in vogue among sexually discriminated minorities: PLUs—or People Like Us. Media content would henceforth be for People Like Us. This served advertisers’ needs and also helped shut out unwanted content. As the daily advised its reporters: dying farmers don’t buy newspapers. South Mumbaikars do. So the suicide deaths of a couple of fashion models in that city grabbed more space in days than those of over 40,000 farmers in Maharashtra did in a decade. 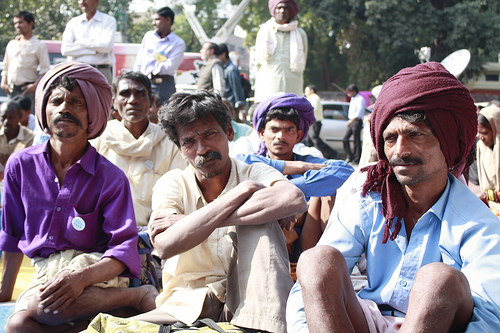 February 2011 saw one of the largest rallies staged in Delhi in years. Lakhs of workers from nine central trade unions—including the Congress party’s INTUC—hit the streets to protest against rising food prices and unemployment. This was many times bigger than the very modest numbers at Anna Hazare’s fast and larger than Ramdev’s rollicking ‘yoga camp.’ These were workers and unions not linked to the state. Not market-driven. Not corporate-funded. And expressing clearly the interests and values of their members. In fact, fitting some classic definitions of ‘civil society.’ The rally was covered by the BBC, Reuters and AFP but was mostly invisible in mainstream Indian media except when attacked for creating traffic jams.